It is the second anniversary of the murder of Sakine Cansız (Sara) a founder member of the PKK and the Women’s Freedom Movement. 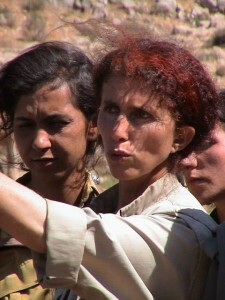 Sakine Cansız was known for her part in the party’s legendary prison struggle and represented the spirit of women’s international solidarity in the 21st century. Sakine Cansız was one of the sources of the strength, morale and motivation of the Kurdish Freedom Movement. Sakine Cansız’s 40 years of experience of resistance and struggle, her courage, passion for life, loyalty, enthusiasm, determination, honesty and simple outlook on life, her love for the Kurdish leadership and a free Kurdistan established the identity and hue of the Kurdish Freedom Movement. Sakine Cansız’s personality and stance towards struggle became the personality and identity of the Kurdistan Women’s Freedom Movement. Her self-sacrificing personality and passion for freedom shaped the character of the Women’s Freedom Movement. She was active in many parts of Kurdistan, organising countless people and bringing them into the struggle. She encouraged thousands of women to go to the mountains and was one of the leading figures in the legendary resistance against 12 September fascism in Amed prison. .
Sakine Cansız devoted her entire life to the struggle for the freedom of Kurdistan. Women have not just lost a friend, they have lost their mother goddess. That is why their pain is so profound. Sakine Cansız was born in the village of Tahtı Halil in Dersim in 1958. After the military coup of 12 March 1971 she became interested in the youth struggle. She took her place amongst the revolutionaries newly emerging in Kurdistan. Cansız worked organising workers in Izmir for a long period, during which time she was with the Apocu group led by Kurdish People’s Leader Abdullah Öcalan. From Izmir she went to Elazığ where she was involved in active struggle against fascists. Although she was involved in the Feyzi Çakmak and Yıldız Bağlar neighbourhoods of the city where Alevi Kurds live, she concentrated on the national struggle in Kurdistan. By 1978 she was involved in women’s committees and the self-organisation of women in the Dersim area. With the formation of the PKK she became an active professional revolutionary. She attended the founding congress of the PKK on 27 November 1978. In this period preparations were being made for the military coup of 12 September and Cansız and a group of her friends were arrested in Elazığ in 1979. After the coup she was in the notorious prison in Amed when torture was at its most intensive. She did not give in despite all the torture and was involved in the resistance to it. Later she was in prisons in Elazığ, Malatya, Bursa and Çanakkale, where she fiercely opposed efforts by the prison authorities to turn women prisoners into informers. In 1991 she left prison and stepped up her active involvement. Sakine Cansız first went to the Mahsum Korkmaz Academy, where she attended the first prison conference. For a time she stayed in Palestine, Syria and West Kurdistan. 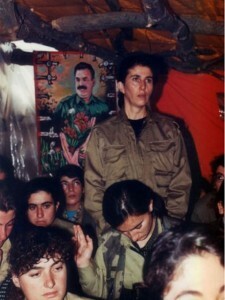 She then joined the guerrilla struggle in the mountains of Kurdistan. She attended conferences and congresses of the PKK and the free women’s movement. She played a leading role in the organisation of the women’s army and party. Then she went to Europe. Sakine Cansız continued her work in Europe, while going to Kurdistan at regular intervals. In Europe she continued her work, endeavouring to ensure that the Freedom Struggle in Kurdistan became known on international platforms and working for solidarity between revolutionary organisations. While involved in the revolutionary struggle, founder member of the PKK and a leading member of the women’s movement, Sakine Cansız, was murdered along with comrades Fidan Doğan and Leyla Şaylemez in Paris on 9 January 2013.